Designer Marc Lombard took on a triple challenge when drawing the Sun Odyssey 349. First, it’s not easy designing the smallest boat in a fleet that now includes the 509, 469, 439, 409 and 379; the expectations of performance and comfort created by the bigger sisters are tough to follow. Second, the 349 is replacing the popular 33i, another tough act to follow. Finally, the base price is just $125,000. That’s a lot of boat for the buck. The profile is surprisingly sleek for a short, wide boat, and that’s mostly due to the low cabintop. The hull has a reverse sheer for increased interior volume and a hard chine that develops well forward of maximum beam to add stability. The standard fin keel with an elongated bulb and lifting wings draws 6ft 6in, while the shoal draft keel draws 4ft 10in. 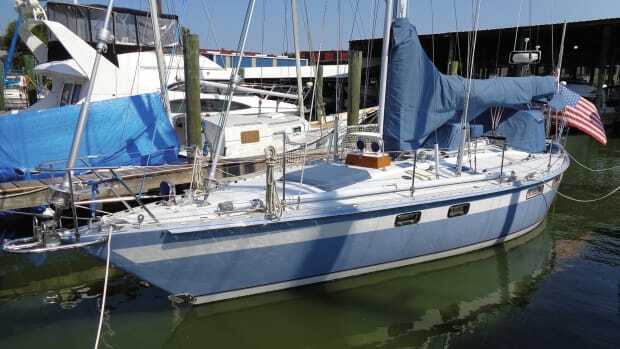 A swing keel is rumored to be in the works, but the test boat was a pre-production model, one of the first half dozen to be launched, so the options were still developing. 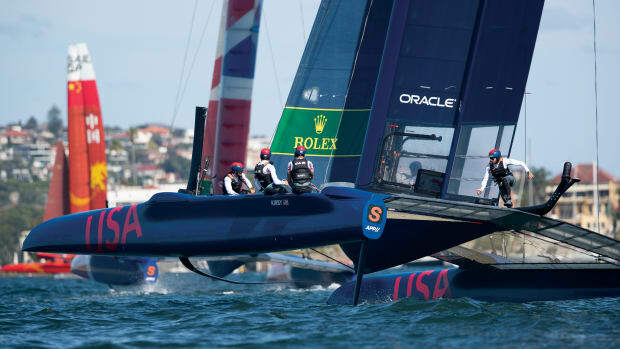 To accommodate its 11ft 3in beam, the boat has twin rudders to help it keep a grip on the water at all angles of heel. The hull is hand-laid fiberglass with a fiberglass grid. 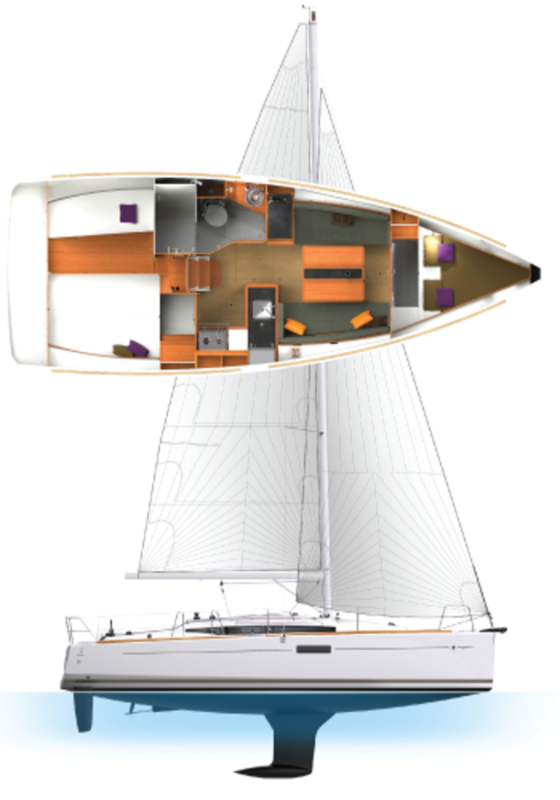 The injection-molded deck, constructed using the Jeanneau’s patented Prisma process, is cored with end-grain balsa. 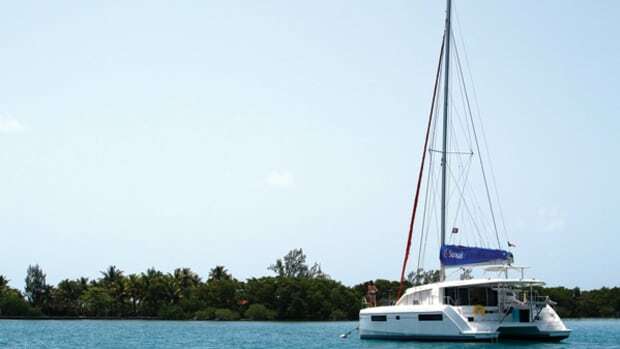 The Seldén fractional rig supports double aft-swept spreaders and flies a total sail area of 613 square feet when the classic main and a 110 percent jib are hoisted. Both are supplied by Technique Voile. 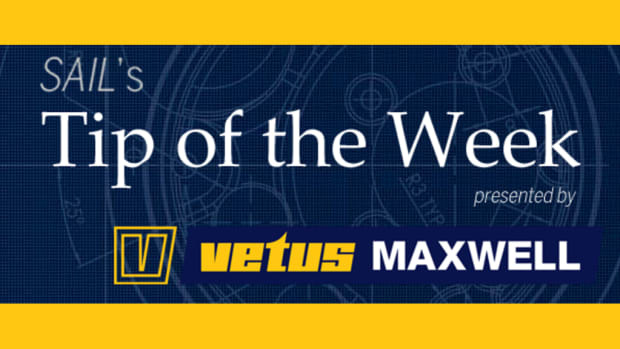 The mast is tall, almost 51 feet, and there is no need for a backstay (although one is optional), making it possible to order the boat with an optional square-top mainsail that increases total sail area by 11 percent. The headsail is on a Facnor furler, and a furling main is optional. 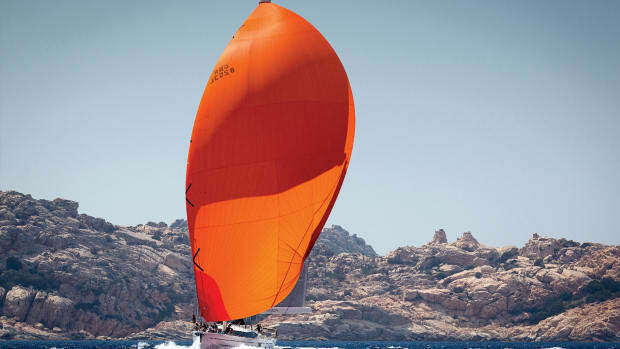 Some cost savings were made in the form of a carry-over from Jeanneau’s Sun Fast racing series, which incorporates friction rings rather than tracks and fairleads for the genoa sheets. The “Y” bridle mainsheet also uses friction rings, eliminating the need for a traveller, so that the rigid vang becomes the primary means of controlling twist in the leach. [advertisement]Another advantage to having no backstay is that it opens up the back corners of the cockpit for a pair of comfy seats within perfect reach of the twin wheels. Four Harken winches do the heavy lifting, while Spinlock jammers secure the lines both near the primary winches and on the coachroof. The B&G electronics packages on the test boat included a multifunction display at the starboard helm. Finally, this may be a small boat, but it has a very large transom. In fact, the manual drop-down transom (with gas shock assist) is larger than on the 409, the model that launched the latest Sun Odyssey series a few years ago. The extra outside living space this platform adds is impressive and greatly enhances the onboard experience at anchor. The layout includes a choice of two or three cabins and a single head. 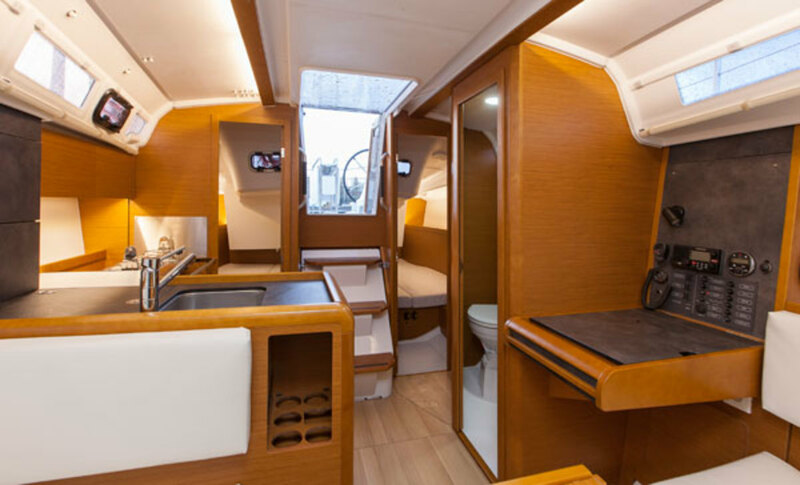 Couples with occasional guests or few children will want to choose the two-cabin version, not only for the extra lazarette storage to port, but also for the larger head with a sizable stall shower that is made possible by eliminating the third cabin. The L-shaped galley to starboard is compact but workable with a single sink near the centerline, a two-burner stove, an optional microwave and a Frigoboat top-loading refrigeration with a multi-stage compressor for maximum efficiency. There’s not much countertop space for food preparation, but storage is adequate for weekend trips. The master cabin forward has a V-berth with the water tank underneath. Although the space is a bit cramped, Jeanneau has solved at least some of the problem by using a pair of narrow double doors that create a nice opening to the saloon when privacy is not an issue. The saloon has an impressive 6ft 3in of headroom and includes a drop-leaf table, which opens up the space when down, but can comfortably seat four for dinner when up. A dedicated aft-facing nav station incorporates the port-side settee as a seat and is a bit of a pleasant surprise on a vessel this size. The boat is equipped with LED lighting throughout. This includes the nav lights on deck. We glided out onto a very sunny and slightly breezy Biscayne Bay, where we had plenty of maneuvering room for our test boat, which came equipped with the shoal keel and fixed prop. This boat likes to sail on the wind sheeted in flat. With 10 knots of true wind at a 40-degree apparent wind angle, we scooted along at 5.3 knots. When the wind inched up to 11 knots and we cracked off to 60 degrees, we bumped up to 6.1 knots. On a broad reach we managed 4.9 knots at 130 degrees in about 9 knots of true. [advertisement]Tacking was easy, and the boat responded quickly. Unfortunately, we didn’t have an asymmetrical or the optional sprit forward to test downwind ability any further. However, given the boat’s performance under working sail alone, I’m guessing it would be a blast. On the flat water of the bay, the 21hp Yanmar pushed the 349 at 6.1 knots at 2,900 rpm. 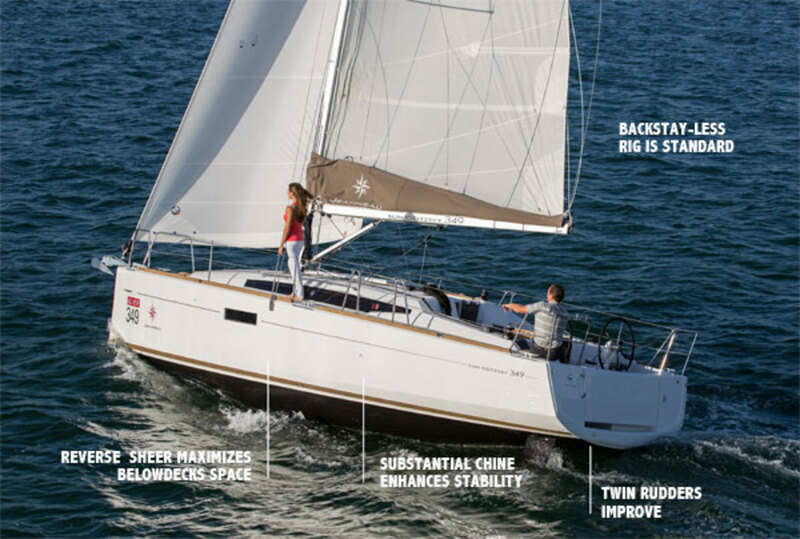 Unlike the rest of the line, the 349 does not offer Jeanneau’s 360 Docking option with joystick maneuvering.  You’ll hardly need it, though, because the twin rudders make the boat responsive and the fixed three-blade propeller bites accelerates the boat swiftly. A Flexofold folding propeller is optional. 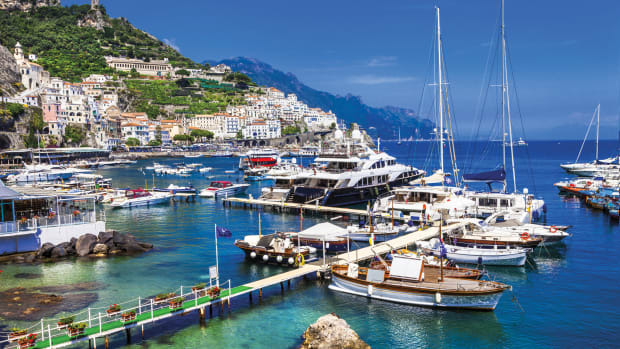 While conventional wisdom has it that 50 is the new 30, the boating world is going the opposite way, packing a lot into a small footprint. 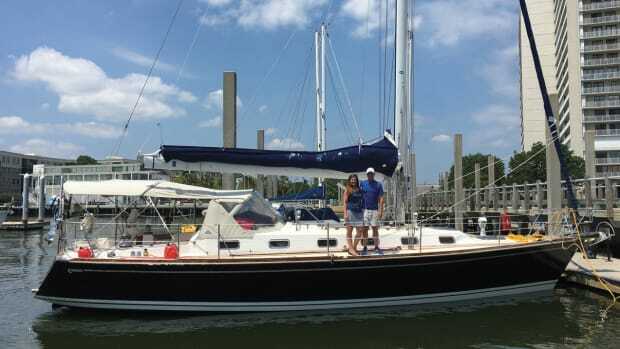 For a young family, the Sun Odyssey 349 is the perfect platform to begin an ascent to larger models. For more “mature” couples who believe that 50 can still behave like 30, it’s a great vessel to step down to and do all the things we did 20 years ago—and then some.